As most of you know Jaxson has a condition called DYRK1A syndrome, and was diagnosed April of this year. Since his diagnosis we have found an awesome Support Group on Facebook! There are families from all over the globe on this support page, and currently we are sitting at about 205 families! That is AMAZING. With the new technology of genetic testing more and more families are getting long awaited answers for their children! Some have waited over 15 years to get answers! Since joining this group I have become a member of their Work Group with a goal to become a Non Profit Organization. With this we established an Awareness Date, August 21st, which is significant because this syndrome is found within the 21st Chromosome. There was a Meet Up in July where many DYRK1A families came together to meet and celebrate with their warriors. There were a lot of guest speakers present as well, they are conducting research of our children to help us and others to understand DYRK1A better. DYRK1A is so new that there is not very much literature out there about it. -Thank you to the team from Bernier Lab for providing this information. 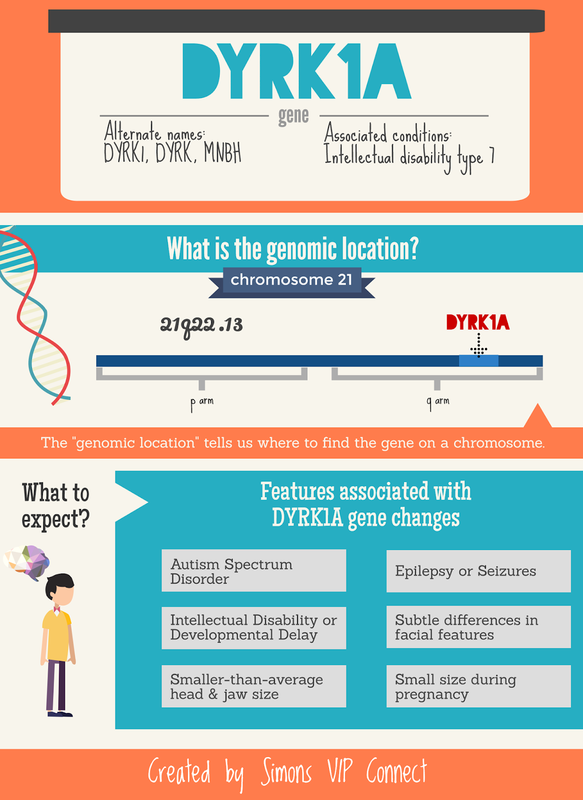 Below is an image from Simons VIP Connect with features and the genomic location of DYRK1A. For Awareness Day, I wanted to show the world that there are positives about our DYRK1A children. Positive you may ask? Many look at the negative when they learn about Jaxson and other children with DYRK1A and their condition. Our children are very, very happy! Despite everything they go through, all of the challenges, they are happy. I think that’s one of the reasons that makes this journey so worth while. Jaxson is goofy just like any other child, he loves to play with his big brother’s toy cars, he loves pancakes, he loves to be twirled around, and loves jamming to the movie Trolls just like his big brother. And if you talk to any other family they will tell you the same about their child. Our children are fierce and determined. I’ve come across a few families who were having difficulties with getting their insurance to pay for genetic testing. I want to raise awareness of the benefits of having genetic testing done. Having genetic testing done can benefit the family because if it comes back positive they can start looking at prevention, monitoring, or treatment options. Jaxson has been in Physical Therapy since October of last year and it has done wonders for his development. He just recently started walking, unsteady but walking! Feeding Therapy has benefited him as well, before it would take him an hour to drink 2 ounces of milk! Now he’s drinking 5-6 ounces of milk in less than 5 to 10 minutes! We are in the process of getting an Occupational Therapist as well. Early intervention is definitely beneficial for our children, so why are these insurance companies denying genetic testing referrals? Jaxson hanging out in the kiddie pool! To conclude this, I ask that you help us raise awareness about DYRK1A. Help us let the world know how proud we are of our children and their accomplishments! Help us educate the world about DYRK1A and the importance of genetic testing! 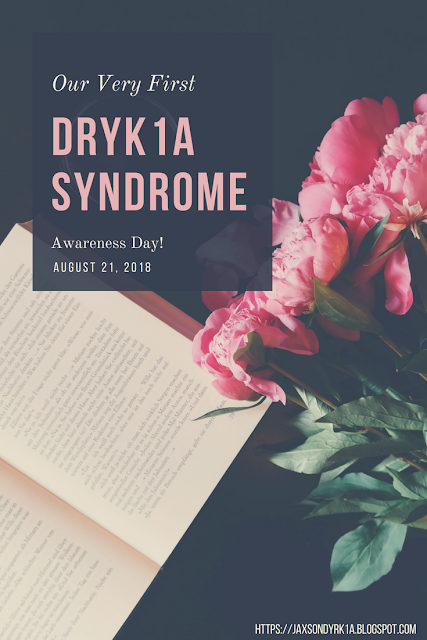 Please join us on August 21st by adding our DYRK1A Syndrome frame to your Social Media photos! In honor of Flashback Friday AND Airway Disorder Awareness Day (July 10th). Jaxson at one month old (left) having trouble breathing, eating, and gaining. Jaxson at sixteen months old (right) eating anything and everything. 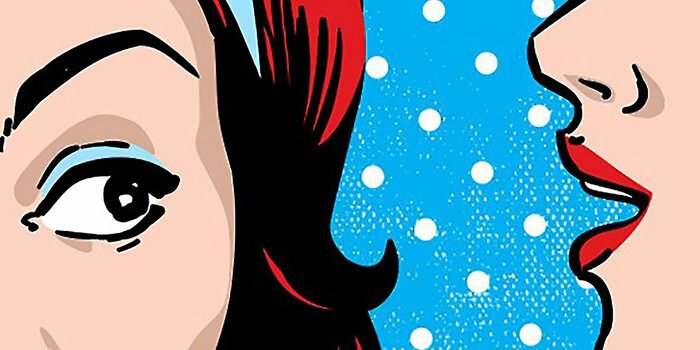 Can drink 5 to 8 oz of milk in less than five minutes.. AND BREATHING EASY. Please support Jaxson and his fellow Laryngomalacia Warriors with painting your nails light blue for Airway Disorder Awareness day on July 10th, 2018.